Or give us a call at (863) 673-7139. 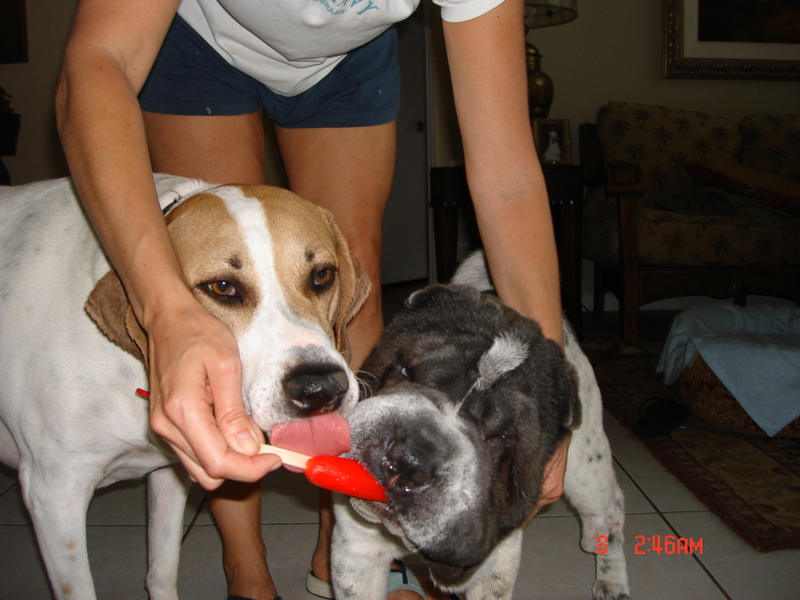 And look how sweet Snoopy is sharing a popsicle with one of his sisters. Here are a few reviews we have gotten from lovely poeple that have got their Pei-Baby from us.If you would like to write one just email me and I will add it! Just to let you know Little Bea is doing fine and gets more loveable every day but is still has a mind of his own and keeps us busy....lots of energy. Had his shots yesterday and won't be too long before he will get his rabies shot. The bear must think he is a King and at least a celebrity at least with all the Royal treatment he has been getting. Also, as of yesterday Little bear weighed a romping, stomping, hard charging 14 pounds. 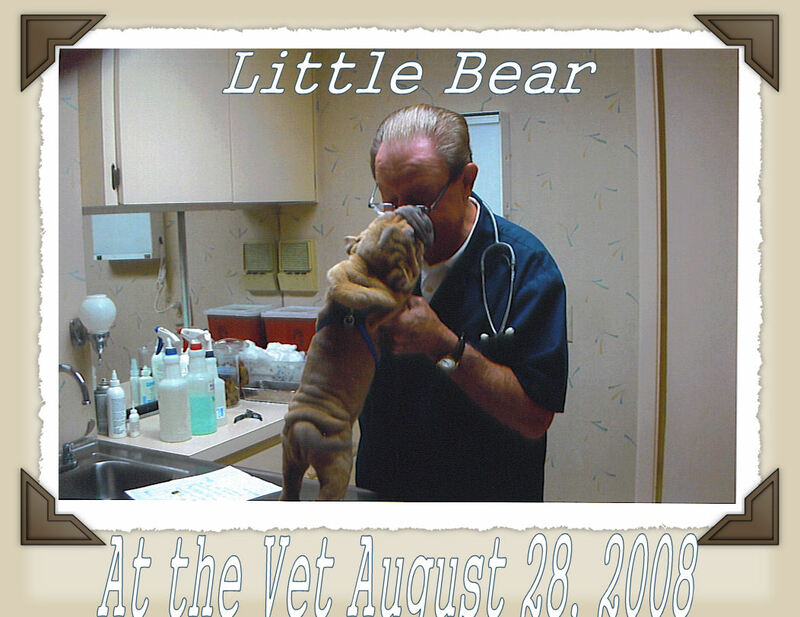 His Primary Care Physician is completely pleased with the Bear's overall progress and everytime we go in he has to take him around and show him off to everyone. One would think he is really proud of the Bear. Which I think he is! Hope you got the pictures I sent a few days ago.. Still looking forward to hearing from you. provided. She seems to enjoy her new Maryland home. Just wanted to give you an update, Bentley is the best dog ever, He loves to play, follows us everywhere, and loves,loves,loves to run up and nap on Nicolette's bed. we got him dog stairs and he climbs right up and down. Bubba is doing great. He is very happy. Yesterday we visit the vet, and he said that Bubba is a very handsom boy. Bubba is absolutely gorgeous and very active, We will send photos of him very soon in his new home. Jodi was a pleasure to deal with - her response was almost immediate, and she was acommodating in the arrangements to pick up my pup. Hannah is a wonderful puppy - healthy, happy, well-adjusted and almost completely housebroken at 8 weeks. Jodi is great with following-up, and it's obvious she truly loves and cares for her dogs. I highly recommend her! We purchased a beautiful flower male shar-pei from Jodi, he's brought extra joy to our house hold. We have 3 other female dogs and they all took to him right away. He's just one little bag of wrinkles, I would definitively recommend Jodi if your considering purchasing a pei. We bought both our puppies from Jodi. We got Liberty and Bella from her who are beautiful healthy puppies. 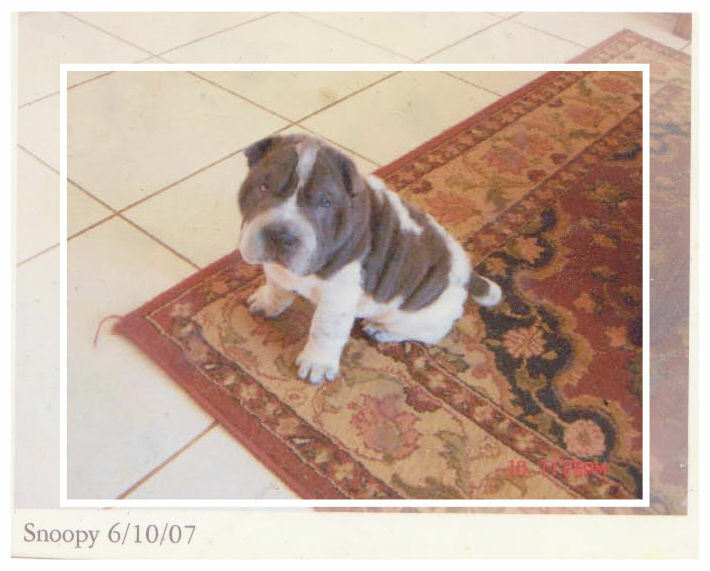 Our friends fell so in love with them that they bought their own sharpei from Jodi, Jetta. All our puppies are doing great and growing up together here in cold, snowy Ohio. We were blessed with three wonderful additions to our families! They are all doing great and are not only beautiful but healthy and very loving. We all look forward to many wonderful years with our puppies. Jodi was ver accomodating with all of us during our time of purchase and it was obvious that our girls were very well taken care of before we got them. I would definitely recommend buying puppies from Jodi's litters. We are loving our time with our wonderful new additions to our families and homes! 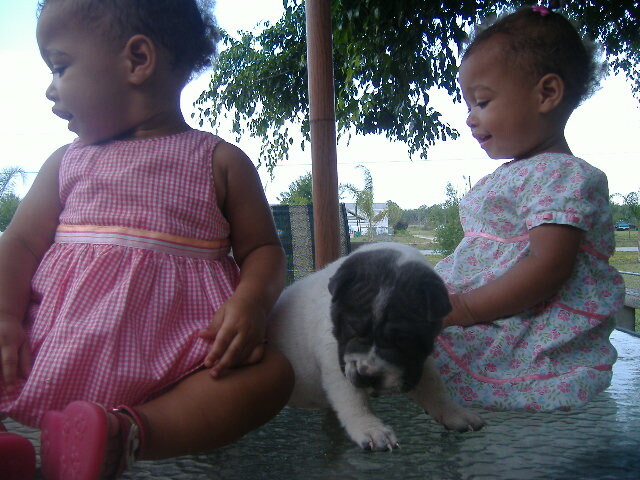 We bought our little black female puppy from Jodi & we have been very happy with our choice. She is very healthy & has a wonderful friendly outgoing temperament. Excellent person to work with!!! So Happy!!! This was my first time to purchase a puppy online,and to have one flown to me,I was a little worried at first, but Jody walked me through the whole process and answered my never ending questions she was extremely helpful and set my mind at ease, I am so happy I purchased a puppy from Jody, she kept me updated as to to the progress of my puppy and sent me pictures of my baby 2 or 3 times a week until I recieved Princess Fiona!! (lol my son named her!!) But we only call her Princess, when she arrived I was tickled pink because she was dressed all in pink, and her nails even matched, as well as her blanket, Please don't hesitate to purchase a puppy from Jody she is the best breeder out there, and we will definately be back to purchase another puppy from her. Thank you so much Jody you have made our family complete and proud to own a Shar-Pei Princess (Foina) will be loved forever!!! Very honest and willing to work with you! I would recommend to any buyer. She has great stock and I am so pleased with our boys! Will Buy from Jodi again ! I got my Shar Pei about a month ago from Jodi. My family and I could not be happier ! I'm always worried when buying anything online but when it comes to a pet you worry more. But I promise you NO NEED to worry when buying a Shar Pei from Jodi SHE IS THE BEST BREEDER OUT THERE ! She answered all my never ending question with no problem. And has been in contacted with us after we got our puppy home. Our vet said that we got a very good Shar Pei. And the ladies at the vet's office go nuts over her when we take her there. My wife, kids, and I THANK YOU JODI FROM THE BOTTOM OF OUR HEARTS ! We will be talking to you soon as we are all ready talking about getting another Pei for Zoe to play with. 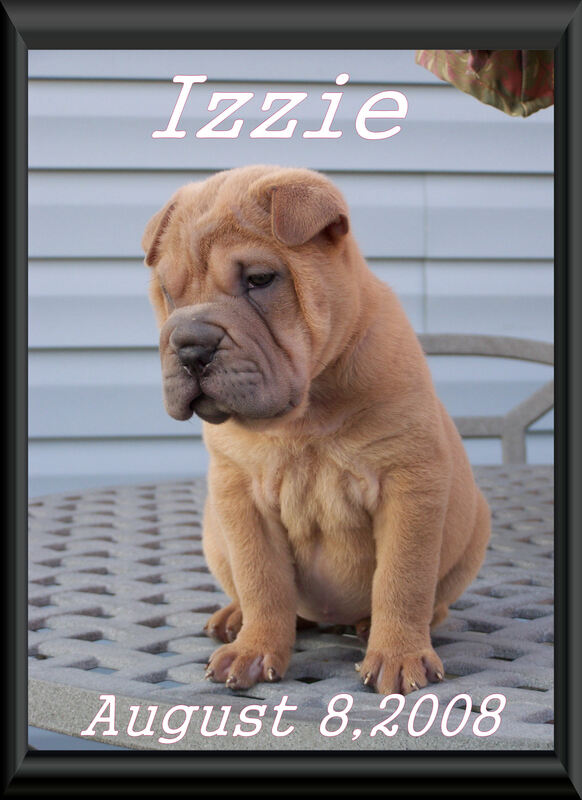 BUYERS YOU HAVE FOUND THE RIGHT SHAR PEI BREEDER, YOU CAN'T ASK FOR NO ONE BETTER ! Being my first purchase on line, I was nervous about sending the money and about getting a healthy puppy. There were several reasons why I choose to buy from Jodi. Jodi was friendly, knowledgable and helpful with all my endless e-mails. 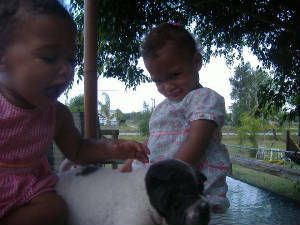 Another reason why I choose Jodi’s puppies is because her dogs are raised in her home with love. This makes a difference because when I got Bella (my puppy) was already well socialized. Plus I knew that Jodi takes care of her puppies by the way she wanted to ship Bella. She wanted to only use Continental because it was safest way. When Bella arrived, I can tell she was loved and superbly taken care of by Jodi and in many ways, I am thankful. Now, I have a healthy happy puppy. Look no further, not only does she have the best puppies but she has provided the best service. I am a satisfied customer and highly recommend JODI TIMMONS to anyone looking for a puppy. If you are looking to buy, feel free to contact me about Jodi Timmons. My heart was quickly won. And turns my grey skies blue. CHECK IT OUT LOTS OF PICTURES!